Wagner Flexio 890 sprays un-thinned paints including paint and primer in one product. The ispray nozzle can be used on interior as well as exterior surfaces. It has the adjustable trigger to control material flow for ideal material application. 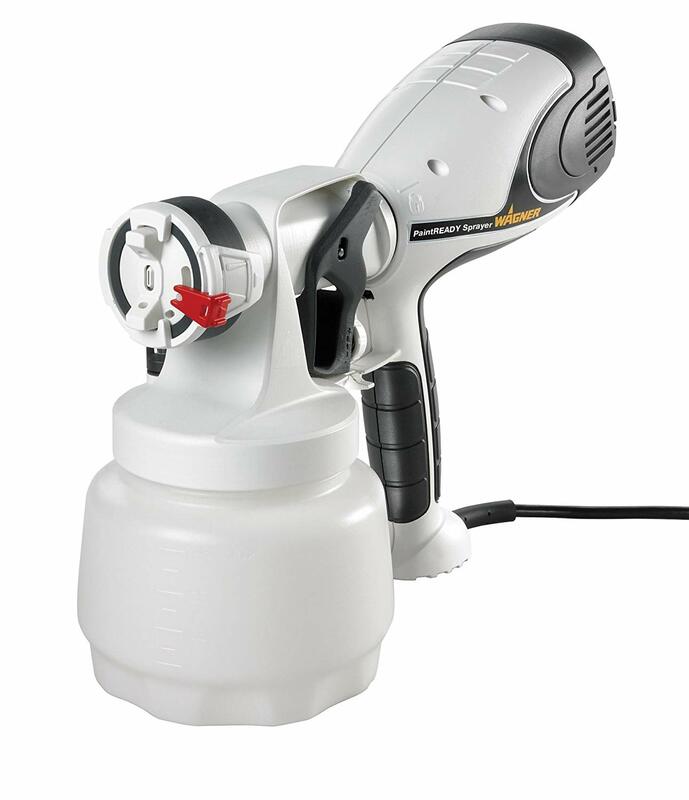 Wagner Control spray features HVLP (High Volume Low Pressure) air power technology to spray thin materials, which gives you maximum control with 3 spray patterns and a variable control trigger. The sprayer helps you get the job done fast with a professional fine finish. 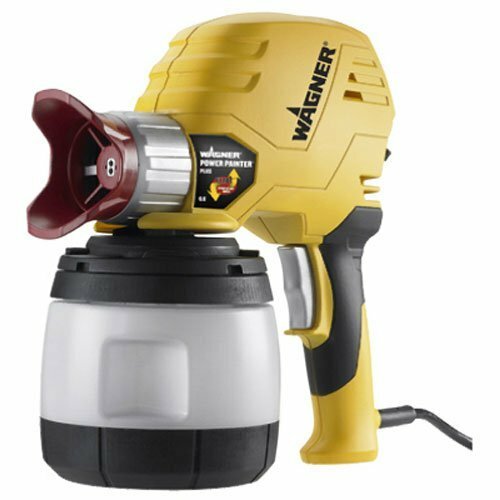 The Wagner Power Painter Plus Plus is a hand held sprayer designed for the individual to do painting yourself with less hassle and more speed as compared to brush. EZ Tilt allows you to spray at any angle, also Optimus Dual Tip provide a professional fan shaped pattern preferred for achieving the best, most even finish. Graco is the brand preferred by the DIY enthusiast whether a homeowner or a painting professional. 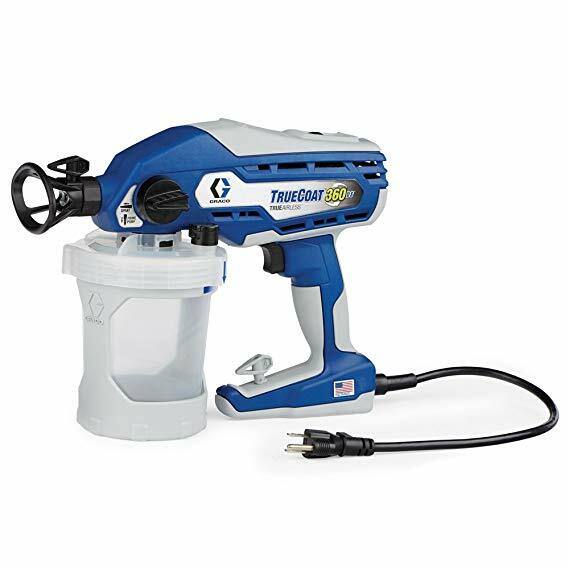 Graco TrueCoat is perfect for a variety of indoor or outdoor projects or any small home improvement project you may have throughout the year. Includes 2 – .015-inch Reversible spray tips, 4 in. narrow and 12 inch wide, 4-32 oz. Flex Liner Bags and Operation Manual. Paint Ready sprayer’s patented technology allows you to spray interior and exterior latex paints without thinning. 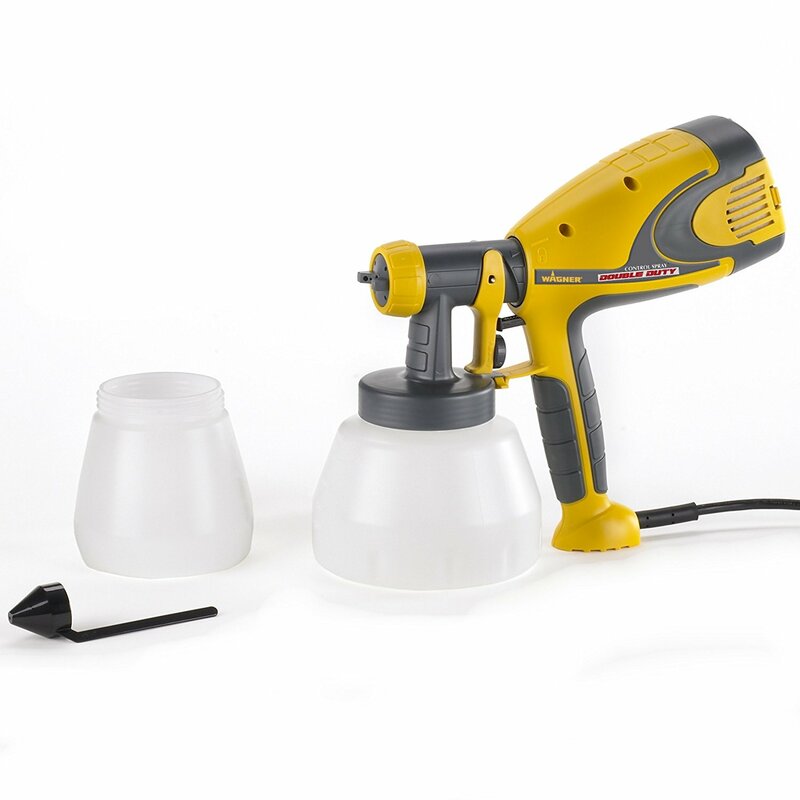 The nozzle’s unique design sprays a roller-like finish with un-thinned latex, making it ideal for your indoor painting project. The multi-purpose hand held HVLP sprayer also gets you smoother finishes with thinner-bodied materials. The integrated controls allow for easy adjustment of spray pattern, width, and direction. Features an adjustable spray pattern, material flow, and air power all on the handle itself hence no need to go to the base to change settings. 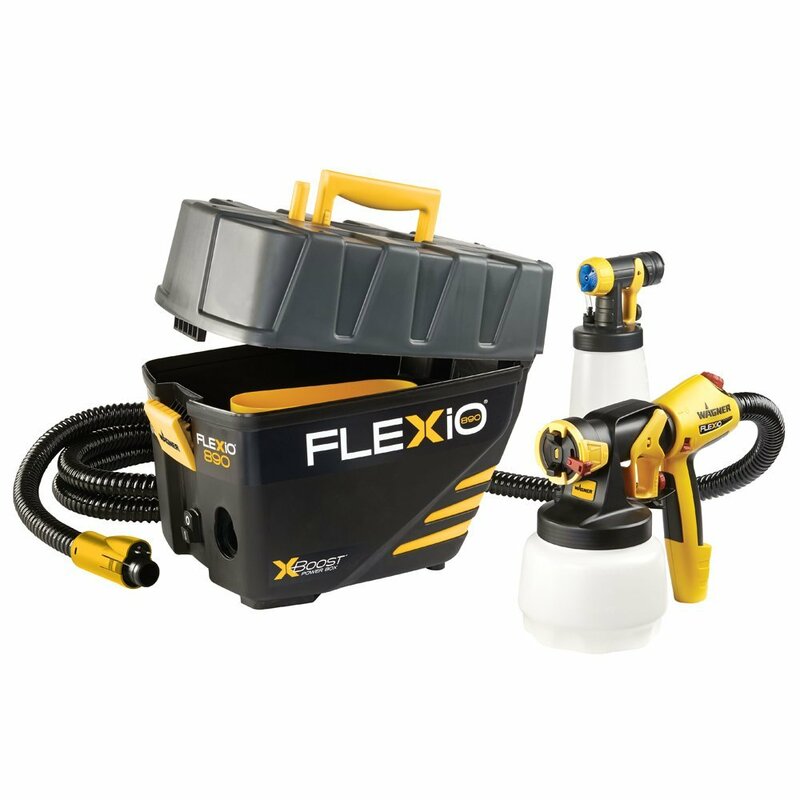 X-Boost Power Box includes the turbine and provides storage for the 11.5″ air hose and handle and two nozzle and cup assemblies – the iSpray nozzle and Detail Finish nozzle. Coverage per Minute: 4.9 fl. oz. The Flex liner Paint Bag System replaces traditional material cups – when you are done, reuse or recycle. VacuValve Technology creates a vacuum for spraying in any direction without losing prime. Dual Speed Control – Low speed for increased control for small detailed work—high speed to get the job done fast. Reverse-A-Clean Spray Tip feature quickly clears tip plugs with a twist. The patented I-Spray nozzle adjusts for either horizontal or vertical spray patterns. You can adjust spray pattern from 1 inches to 10 inches based on your coverage needs. It has variable flow rate up to 12 fluid oz. per minute also, depending on flow volume adjustment and material viscosity. Lock-n-Go split gun design enables quick material change and easy cleaning. Compare Qty of Paint applied in one hr. Wagner Flexio – 1-1/2 quart cup on the iSpray nozzle and 20 fluid ounce cup on the Detail Finish nozzle. Graco Truecoat – 2 to 4 bags having capacity from 32 oz. to 42 oz. Great for fences and jobs with uneven surfaces. Works for all products except latex. Painting house could be inconsistent and time consuming. Clean up takes too long. Not enough power to spray water based latex paints or primers and is quite slow. Sprayer does well for small jobs. It is too heavy and noisy. Clogs up frequently and needs disassembly and cleaning constantly to keep going. Sprays paint everywhere, impossible to be precise. Be the first to comment on "Wagner Flexio vs Wagner Control vs Power Painter vs Graco Truecoat vs Paint Ready"